Description: This notebook page includes illustrations and text related to wrappers. The illustrations are from Petit Courrier des Dames, 1832. The illustration on the left is from September, 1832. The illustration on the right is from October, 1832. 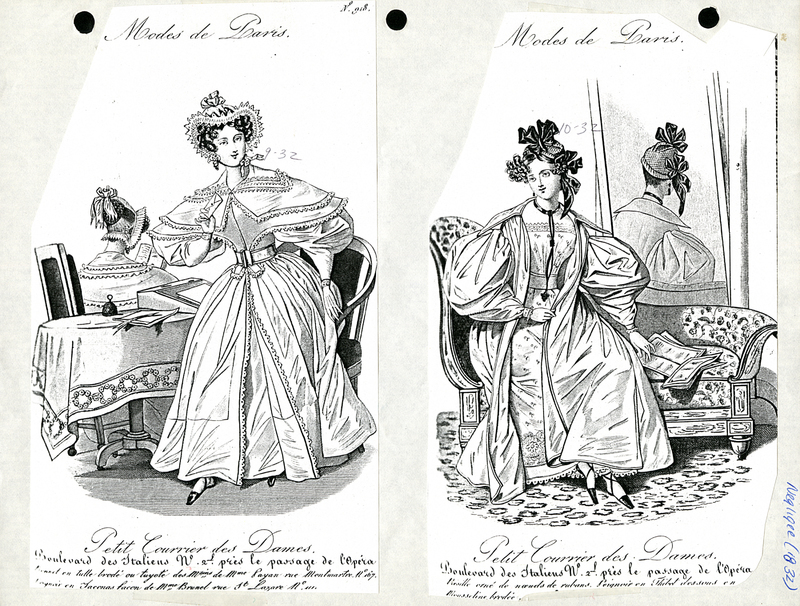 The Wrapper Series consists of fashion illustrations and texts, compiled by Nancy Rexford, from periodicals dated early 19th - early 20th century. Rights: This image, from the Rexford Costume Research Archive, is licensed under a Creative Commons Attribution-NonCommercial-ShareAlike 4.0 International License. “Wrappers Series: Wrappers 1830-1839, page 03,” Historic Dress, accessed April 22, 2019, http://historicdress.org/omeka2/items/show/489.